Yuhuu!!! How was your May? Well, for me apart from trying to stay grounded for and spend more with my parents in KL I managed to squeeze some time out for a short trip to Singapore. Here we go… to YouTube Fan Fest 2015 in Singapore. HP announced their latest technology that empowers us to produce, consume and share content in our own creative ways. From left: Brad Swiney, Media & Analyst Relations Manager, HP Printing & Personal Systems Asia Pacific & Japan; Kurt Schneider, Youtuber, Songwriter, Director & Producer; Anneliese Olson, Vice President, Computing Solutions, Printing and Personal Systems HP Asia Pacific & Japan. Here is the highlight! HP launched the new Notebook with fresh designs and bold colors; plus the new lineup of stylish and powerful Desktop PCs during the press conference at the Fan Fest in SCAPE HubQuarters.What I like the most is the colorful HP Pavilion x360s that flip from notebook mode for working, stand mode for watching, tent mode for playing games to tablet mode for on the go. 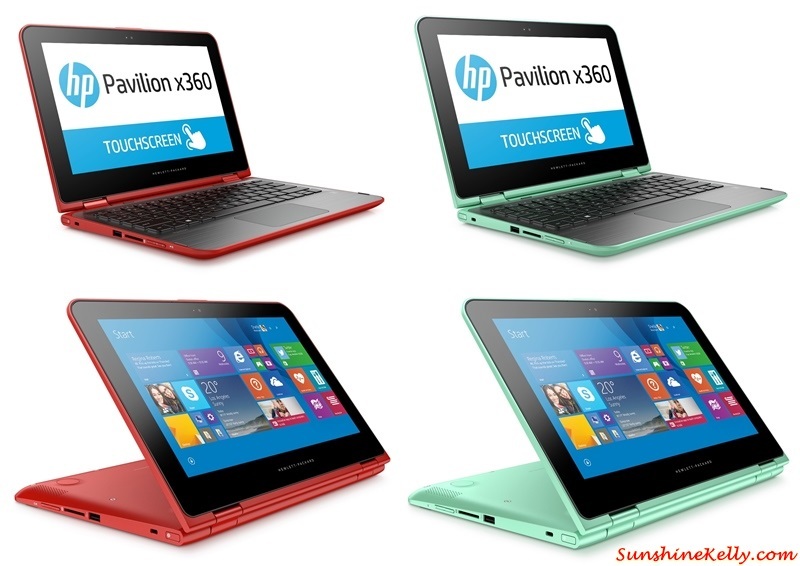 The minty green Pavilion x360s is to die for (my favourite – love it). From left: Brad Swiney, Media & Analyst Relations Manager, HP Printing & Personal Systems Asia Pacific & Japan; Timothy Parker, Vice President & general Manager of Direct and Channel Sales HP Asia Pacific & Japan; Yam Su Yin, Vice President of Consumer PC & Mobility BU Printing and Personal Systems Group HP Asia Pacific & Japan. HP listens to consumers’ feedback and delivers a new lineup that matches our lifestyle. They have combined bold new colors from the runways in Milan with the latest processors to give customers systems with a fresh new look that deliver better performance and battery life across the board. The HP Pavilion x360s have an innovative new hinge that uses a set of three spiral gears for synchronized and precise movement to ensure the display glides smoothly and stays in place where the user wants it while maintaining the same thinness when closed or in tablet mode. It’s available in a new color palette including Sunset Red and Minty Green. The high definition (HD) IPS display makes gaming and movies more enjoyable with crisp images that look great at any angle. For the best sound reproduction, the HP Pavilion x360s have B&O Play audio. The HP Pavilion x360 uses a fanless design, and for 2015 is now available with Intel® Core™ M-5Y10C processors in addition to Intel® Celeron® or Pentium® processors. With a 32 watt-hour battery and the Intel® Core™ M processor, the new HP Pavilion x360 packs up to four more hours of power than the previous Pentium-based model. You can enjoy up to eight hours and 15 minutes of battery life. The HP Pavilion x360 comes with up to 8 gigabyte (GB) of system memory. The HP Pavilion x360 supports a full-sized HDMI port, two USB 3.0 ports and one USB 2.0 port. Apart from the x360s, the redesigned HP Pavilion notebooks offer us a variety of hardware choices to match our lifestyle because some of us want colours, display and hardware options. The HP Pavilion notebooks come in a vast selection of colors including Natural Silver, Blizzard White, Sunset Red, Cobalt Blue, Violet Purple, and Peachy Pink. As an added design element, the HP Pavilion notebooks have a gradient metal like finish on the keyboard deck. The dual speakers tuned by B&O Play give customers more immersive sound experiences. The HP Pavilion notebooks have a redesigned unibody chassis for quality and reliability with HD or Full HD on the 15 inch notebook, touch or no touch in both the 14 and 15 inch diagonal displays. HP Pavilions come with the 5th generation Intel® Core™ i3 through i7 processors, up to 2 TB of HDD on select models and up to 16 GB of system memory. For the first time, customers have the option to select between AMD Radeon™ and NVidia discrete graphics processors on HP Pavilion notebooks. For portability and power, the HP Pavilions are thinner and lighter with tuned for longer battery life. The 14 and 15 inch HP Pavilions get up to eight hours and 15 minutes and 7 hours and 30 minutes of battery life respectively while weight is reduced across the line. Colorful accessories are available today and offered separately to amplify customer experiences on HP PCs. Hey do check out HP’s wireless speakers, wireless and Bluetooth mice and sleeves for added personalization too! Price & Availability: HP Pavilion x360 11” is RM1,899 will be available in July 2015 and HP Pavilion 14” (1TB HDD) RM2,399 is available since May 2015.